With the release of her cookbook, Food, Health and Happiness, Oprah Winfrey really can say she’s done it all. There’s no denying Oprah knows a thing or two about good living. Not just because she’s one of the richest people on the planet, although that certainly helps! But because her fame and fortune has afforded her the opportunity to be in the company of some of the most talented chefs, designers and health aficionados. People we aren’t typically exposed to. The same people who helped Oprah create her own home, life and dinner party menus. Oprah’s appreciation of good food and good living combined with the knowledge she’s acquired from her talented friends and employees will influence everything she does pertaining to lifestyle. When Oprah shares I listen, borrow and apply when and where I can. For example, those sorbet recipes you see above. I assure you those sorbets taste just as delicious as they look in that pretty little picture. Likely due to the tips Oprah’s received from her famed chefs. I prefer a sorbet over ice cream. I never liked the way my mouth or my body feels after eating whole milk ice cream. It turns out I am lactose intolerant, though, I didn’t know this until I was an adult. After attending a health presentation a few years ago I was inspired to try my hand at making sorbets and shakes. They were delicious. Even my husband, a die-hard chocolate and sugar lover, agreed the homemade desserts are competitive to the store bought products he was used to eating. Knowing it was healthier was an added bonus. He said there was no sugar crash either. I think sorbets are a delicious healthy alternative to store bought anything. Even better is that I know what goes into my food. I’ll share some of my own recipes with you down the road. But for now, I think Oprah’s sorbet is ‘peachy-keen,’ as they said in the fifties. If you have kids this would be something fun to try with them, too. Let me know if you try the sorbets. I want to hear what you think. And don’t forget to share this if you like what you read here! Cook time: 2 hoursCombine all the ingredients in a high-speed blender and blend until smooth. Pour into a container and refrigerate until cold, about 2 hours. Pour into an ice cream machine and churn according to the manufacturer’s instructions. I do believe Martha Stewart finally has some real competition. 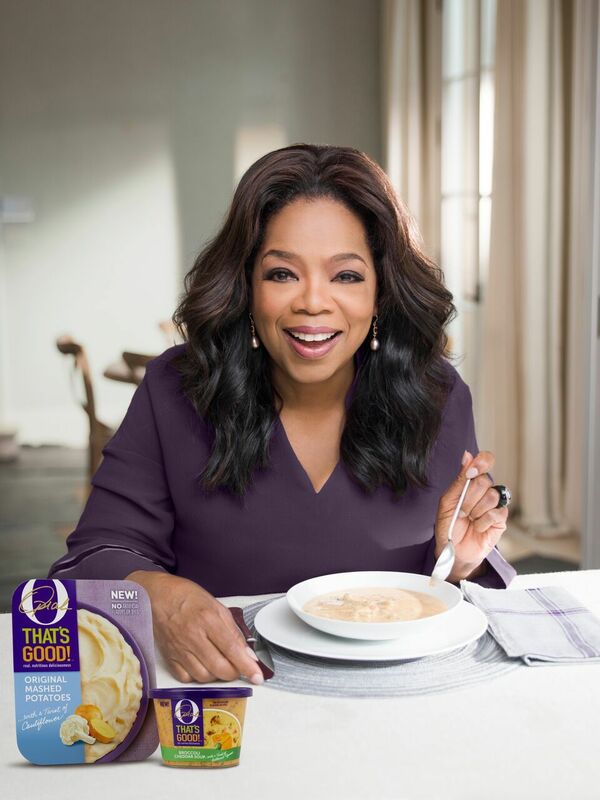 The Kraft Heinz Company and Oprah Winfrey recently announced the debut of O, That’s Good!, a line of four flavorful soups and four savory sides that bring a nutritious twist on comfort food classics to everyone’s table. The twist includes healthy substitutions like replacing some of the potato in their Original Mashed Potatoes dish with mashed cauliflower. In their Broccoli Cheddar Soup they’ve replaced some of the cheese with velvety butternut squash – increasing the number of veggies while keeping all of the rich flavor in every bite. The O, That’s Good! Soups will retail for $4.99 and the sides will go for $4.49. You can expect to find the new line in the refrigerated section in select grocery stores and will be available nationwide in October 2017. For more information on O, That’s Good! Soups and Sides, please visit http://www.Othatsgood.com.